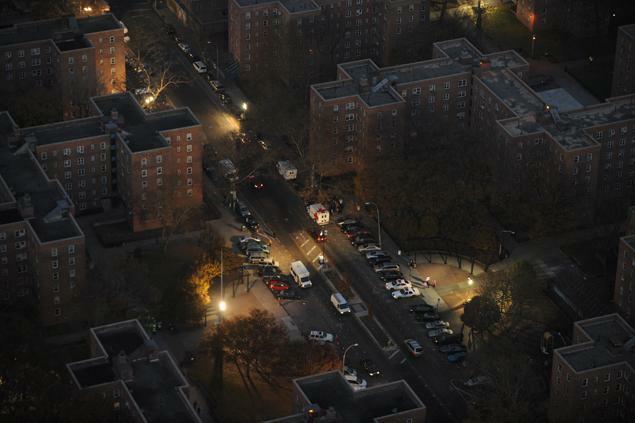 In the days and weeks following Hurricane Sandy the inequalities at the heart of New York City could scarcely be missed. While hundreds of thousands of public housing residents went without heat, hot water or electricity, Mayor Michael Bloomberg rushed to get the stock exchange up and running within 48 hours—a stark reminder of whose lives and well-being are valued by current administration. In the immediate aftermath of disasters such contrasts lay bare the violence of race and class. Who is able to leave and who is able to return are questions about access to resources, vulnerability, and the existing geographies of economic and social inequality. But it is through the process of reconstruction that existing racial and class iniquities are truly reproduced and deepened. In New York City, as the power has finally come back on for residents and as reconstruction efforts plod along, it is perhaps time for a look at how these dynamics are playing out. In early November, 2012 I attended a meeting in the Red Hook loft apartment of the self-styled neighborhood power broker, Kirby Desmarais, the purpose of which was to build stronger lines of communication between various groups working on relief efforts in Red Hook. These included Occupy Sandy, the NYPD, the National Guard, a representative from Mayor Bloomberg’s office, and a sizeable group of small business owners in Red Hook: over 30 people in total. The meeting itself was uneventful, the National Guard did not plan to do any more than distribute boxes of freeze dried meals, the Mayor’s Office could not promise anything concrete, and 76th Precinct Police Captain Schiff remained mostly silent. Occupy Sandy would continue to collect and redistribute material donations, provide hot food, and build its databases of residents requiring home-delivered meals and needing medical assistance. Those of us working with Occupy Sandy began to feel uncomfortable as it became increasingly evident that the underlying purpose of the meeting was for the group of small business owners to establish direct lines of access to the various institutions with power over the recovery effort. One particularly disturbing aspect of the meeting was its racial composition. In this predominantly working class Black and Latino neighborhood, the small business coalition who were hosting the meeting had only managed to invite one single long-term black resident, a well-known local organizer, Reg Flowers. Such an exclusion of black community leaders from the table was, as Reg put it, at the very least “problematic and it may even be dangerous.” Sadly, such exclusions are also increasingly common and they bear witness to the important role played by gentrification in shaping the forms of recovery and reconstruction in Red Hook after Hurricane Sandy. From the outside, Red Hook recovery efforts have been lauded in both the media and in activist circles as a stirring example of “community” self-empowerment and mutual-aid. What is less evident from most of these superficial accounts, however, are the deep social fissures and inequalities that are hidden beneath facile notions of “community.” The emergent pattern of racial and class-based exclusions in Red Hook have historical roots; they are also emblematic of a process that I am calling here disaster gentrification: that is, the use of disasters, such as Hurricane Sandy to initiate or consolidated gentrification projects. Before Hurricane Sandy hit, Red Hook was already on the cutting edge of Brooklyn gentrification and had been for a few years. Urban homesteaders had moved in, lured by the waterfront, the aura of feeling slightly farther away from the rest of the city, and what the New York Times glibly calls “the pioneer spirit that has brought chicken coops, beehives and funky bars to a once-desolate industrial stretch of Brooklyn.” As some of this growth has come through the reconversion of previously empty warehouses and industrial areas, Red Hook is often presented as benign form of urban regeneration and creative re-use of a post-industrial landscape. But as with the pioneers of old, people lived in Red Hook before the recent influx of entrepreneurs. Red Hook has long been a working-class neighborhood. Much of the neighborhood’s urban fabric dates back to its 19th century history as a major hub of maritime commerce. Since the construction of its first port in the 1840’s Red Hook has been home to waves of immigrant populations; Irish, German and Italian workers came for employment on its docks. By the 1920s it could claim to be one of the busiest freight ports in the world. The first of the Red Hook Houses were built as part of a Federal Works Program initiative under FDR in 1938 to accommodate the growing number of dockworkers. Administered by the New York Housing Authority (NYCHA), these tall brick structures are still a defining feature of the neighborhood. Home to 8000 people, they remain the largest affordable housing tract in Brooklyn (and the second largest in New York City). The last installment of the Houses were built in 1955. Then, with the advent of containerization in the 1960s, shipping moved to the larger ports of New Jersey and Red Hook’s economic vitality declined. During the latter half of the century Red Hook followed the pattern of many de-industrializing urban areas in the United States: white flight opened up space for Blacks, Latinos, and one of New York City’s first Puerto Rican communities. Meanwhile, disinvestment and capital flight from Red Hook, as in many other parts of Brooklyn, left the neighborhood derelict and abandoned by government, public services, and landowners alike. As the late great geographer Neil Smith has argued, neighborhoods like Red Hook were “lost” for capitalist profit extraction: practices such as redlining ensured that no new capital would be invested in these enclaves of urban poverty. This set the stage for Red Hook’s more recent history of gentrification. As Smith argues, gentrification is effectively a “back to the city movement for capital,” through which such “lost” urban spaces are re-conquered for the purpose of profit extraction. Of course, the conquest of the “new urban frontier” inevitably entails the displacement of those who once lived there. Thus, as capital began moving back to the city, it spelled a disaster for working class people across Brooklyn: eviction, harassment, highly racialized tough-on-crime policies, the forcible displacement and dismembering of communities. Census data bears witness to the rapid transformations that have been reshaping neighborhood like Red Hook. Economic indicators show that Red Hook has seen its median monthly rents increase by upwards of 70% along the water front since 2000 (and 101% in the area directly above the Red Hook Houses), on par with the most rapidly changing census tracts in Williamsburg over the same period. The growing economic disparities in the neighborhood are also evident in this rental data: the median rent at the Red Hook Houses is still $369 per month while loft apartments a block away on Delevan street are listed at 1,900$ per month. This “rent-gap” between what working-class residents have been paying for decades and the promise of ever-rising rental incomes from an affluent gentrifying class is what fuels both property speculation and the forced evictions of long-time residents. Such processes are at the heart of Brooklyn’s changing political economy—they have also had dramatic impacts on the changing racial demographics of its neighborhoods. As a recent Fordham study has shown, Brooklyn is home to four of the country’s most rapidly changing neighborhoods as measured by racial composition. In Bed-Stuy, for example, the white population has grown by over 600% over the past decade. Meanwhile, the Center for Urban Research estimates that Brooklyn lost 50,000 African Americans to economic displacement between 2000 and 2010. Red Hook has lost 17% of its Black population and 14.4% of its Hispanic population over the same period. As people are priced out of the neighborhood, block-by-block census records show that the Black and Brown population of Red Hook has quickly receded away from the main commercial strip of Van Brunt street and is now predominantly concentrated in the Red Hook Houses. The old Puerto Rican community of the waterfront has vanished, displaced by affluence and whiteness. Similar violent processes of displacement and conquest have led the New Orleans Tribune to describe gentrification as “the new segregation.” Gentrification may be analyzed as economic project which displaces the poor and benefits the affluent, but it also articulates itself as a racial project whose violence is vested on people of color. Where it unfolds in neighborhoods like Red Hook, such processes bear out Stuart Hall’s famous argument, that “race is … the modality in which class is lived.” As Hurricane Sandy swept through Red Hook, its waters swept over a social geography already deeply injured by the racial and class inequities of gentrification. It is thus imperative for reconstruction efforts to take these existing divisions seriously, because to ignore them is to be complicit in reproducing and deepening them. Dynamics of race and class have impacted Post-Sandy recovery work from the start. On the one hand, the sheer urgency relief work during the first few days created an initial atmosphere of solidarity, cooperation, and mutual-aid with residents and incoming activists working, cooking, and canvassing together. I became heavily involved with Occupy Sandy at its inception and helped set up the recovery hub at the Red Hook Initiative on day after the storm where the words “community-powered recovery” were repeated often and proudly. Indeed, it was inspiring and invigorating to see such spontaneous good-hearted, meaningful, and highly effective work being done. However, the lack of analysis around race and class was evident very early on and lead to a number of problems in the day-to-day dynamics of recovery work. One of the first problems we encountered was the casual racism of charity work. During the first few days after the storm a well-intended Christian group began partnering with the NYPD to distribute supplies using NYCHA housing police. They also asked the police to provide “crowd control” for the lines of predominantly the Black and Latino residents waiting for much needed supplies such as flashlights, pampers and baby formula. This use of the police put an immediate strain on the relationship between local residents and activists and created a scenario in which race and resources separated the two groups: inside—a group of predominantly white volunteers managing resources; outside—people of color waiting in line in the cold for hours, with the police doing “crowd control.” This highly racialized treatment of aid-recipient as potential criminals was symptomatic of the staggeringly different ideologies concerning what recovery and reconstruction should look like: the philanthropic Church group thought of themselves as providing a service (which apparently required security). This was a stark contrast to the collaborative, solidaristic, mutual-aid project that Occupy Sandy had been trying to build over the course of the first weeks. Weekends were difficult for similar reasons. The neighborhood would be inundated with (predominantly middle-class white) volunteers who were dispatched to canvass, cleanup, gut dry walls, and distribute food. Much good work was done, but the racial stratification of volunteers and residents clearly began to reinforce existing oppressions, turning aid-recipients into passive agents in a process they had increasingly less and less control over. This is the myth that is often repeated by the entrepreneurs: that “small businesses keep Red Hook alive.” What is quietly elided, however, is the question of who and what is being kept alive? As the figures on economic displacement indicate, it is not the working-class Black and Latino Red Hook which is being “kept alive” by these businesses—and $19 skirt steaks at Home/Made are clearly not priced to provide sustenance for this community. Rather, as small businesses take up the mantle of speaking for “the Red Hook community” they are also putting forward a vision of what such a community should look like. It is telling that the conversation with Bloomberg reportedly focused on “how to attract more shoppers to Red Hook,” re-opening the subway stop at Smith and 9th street, and how to increase foot traffic along Van Brunt street. This vision of recovery and reconstruction is clearly a vision of gentrification-based recovery. The agenda of the small business coalition was captured succinctly by ReStore Red Hook founder, Monica Byrne, at a community meeting in early November: “we will not stop until every single small business in Red Hook re-opens its doors again.” As a vehicle for fund-raising, grant applications, and political lobbying, ReStore Red Hook has become a pivotal actor in the dynamics of recovery and reconstruction in the neighborhood. The example of a large grant awarded by the Brooklyn Community Foundation in December for Sandy recovery work is symptomatic. Through personal connections with Carlos Menchaca, Christine Quinn’s official liaison in Red Hook, a coalition of five organizations in Red Hook (including NGOs, residents and small businesses) were able to secure a large grant from the Brooklyn Community Foundation. Without any community oversight over how such funds ought to be disbursed, 80% of the funds were ultimately allocated to ReStore Red Hook. In a neighborhood where over 70% of the population lives in public housing, to allocate 80% of incoming resources to small businesses along a gentrifying corridor simply callous. It is also a form of institutional racism reproduced and replicated through everyday practices. By mobilizing cultural, legal, and political capital to control incoming resources and funnel them towards small businesses, this coalition is indirectly working to disempower and displace the working-class Black and Latino community of Red Hook. As such, ReStore Red Hook represents the consolidation of the gentrification project after Hurricane Sandy. It is the vehicle through which a gentrifying class in-itself has become a gentrifying class for-itself. It is the consolidation of a class project insofar as it actively organizes a small business class around a common interest. But it must also be understood as a consolidation of whiteness. As meetings in loft apartments become conspicuously racially homogenous and resources are syphoned away from the Black and Brown residents of the neighborhood, disaster gentrification is also project that “ReStores” segregation, poverty, and white supremacy. As the coalition of small-business owners in Red Hook began to control the direction of reconstruction in the neighborhood, they also began to push Occupy Sandy organizers out. Frequently, insider vs. outsider language and appeals to “the community” were used to keep Occupy organizers out of meeting spaces or to question their legitimacy on listservs and in public meetings. Meanwhile, the Occupy Sandy relief hub at the Red Hook Initiative was displaced after its first week of operation when the RHI board of directors decided that they needed to “return to our normal programming.” Contentiously, RHI continued to collect disaster recovery funds even as their own involvement in the recovery efforts scaled back enormously. According to one source who attended a closed meeting with RHI, the non-profit has accumulated over $2 million in Sandy recovery donations. Conspicuously, the eviction of Occupy Sandy from RHI occurred precisely after organizers began to ask questions about how RHI was allocating the recovery funds. A number of us who had originally helped set up the relief hub at RHI after the storm urged them to use a participatory budgeting method for distributing the resources, however the organization has remained completely opaque about how such resources will be used. Indeed, after the initial days of spontaneous good will and solidarity, NGOs and small businesses in Red Hook began jockeying for position and funding to the detriment of pan-neighborhood solidarity, not to mention social justice. In this atmosphere of self-serving political myopia many of us who worked to start a “People’s Recovery” in Red Hook left or were pushed out; some went to other nodes in the Occupy Sandy network, while others withdrew from the recovery efforts completely. In this context, we may draw a number of lessons from the intersections of disaster-recovery and disaster-gentrification in Red Hook. To begin with, the social justice work of Occupy Sandy organizers in Red Hook was particularly vulnerable to being sidelined, subverted, and evicted due to the fact that they did not have deep roots or strong alliances in the neighborhood. Such alliances and ties would have been pivotal for building more effective resistance to the intense political and economic forces of disater gentrification. By comparison, in neighborhoods such as Sunset Park, where Occupy has been engaged in community organizing and anti-gentrification work for the past year, the post-disaster organizing has been more enduring and robust. In the immediate wake of the storm, Occupy activists organized a number of community assemblies in Red Hook with the aim of building a decision-making body through which direct community oversight of recovery efforts might be achieved (including an ill-fated campaign to demand rent abatement from NYCHA). Such efforts were effectively undercut as the important decisions over resource allocation and negotiations with politicians were happening elsewhere. Without a deep organizing base in the neighborhood, Occupy Sandy’s medium-term projects in Red Hook foundered. Ultimately, in order to resist disaster gentrification it is crucial to have a pre-existing base of anti-gentrification organizing. Such a base would have also provided more susatinable, effective, and meaningful ways for “outside” organizers to plug in. Much good political organizing work was done in the days after the storm, but without strong neighborhood alliances this work was quickly demobilized, coopted, and neutralized. In the long run, the conversation about a just reconstruction must also find strategic ways to talk to small business owners. Despite the short-term gains that ReStore Red Hook might achieve through back-room deals with state functionaries and donation drives, theirs is a losing strategy in the long run. The true beneficiaries of Hurricane Sandy will not be small businesses, but rather the large banks who provide reconstruction loans, the companies who receive the reconstruction contracts, and the emergent industry of eco-disaster-capitalism which sees social catastrophe as a business opportunity. Loan providers are already projected to make $1 billion in profits annually from these loans. By contrast, as of late January, out of the 1,119 small businesses that had applied for federal loans in Brooklyn, only 89 had been approved. Those “lucky” enough to be approved will be saddled with huge debts for years to come and some will even have to put up their homes as collateral. Such a system individualizes and atomizes the burden of reconstruction; it also tears apart the fabric of our communities, pushing some into narrow and self-serving alliances, leaving others to fall through the cracks entirely. Indeed, the petty battles over the pittance of resources and funding that do come to neighborhoods like Red Hook end up reinforcing racial and class divides and destroying neighborhood solidarity. As Tom Agnotti has pointed out, such divisions leave neighborhoods vulnerable and fractured in the face of large-scale developers who are then able to move into the neighborhood without much (unified) resistance. If recent talk about moving toxic sludge from the Gowanus canal to a site in Red Hook materializes, all of the neighborhoods residents will stand to lose from the effects of environmental racism and broken solidarities. Ultimately, with the increasing frequency of ecological calamity around the world, social justice activists must begin imagining long-term and pre-emptive strategies for coping with disaster. This means deep neighborhood-based political organizing adequate to the needs of the nascent modality of resistance, something we might call disaster anti-capitalism. Neil Smith. “Towards a Theory of Gentrification” Journal of the American Planning Association. Vol. 45.4. 1979. Neil Smith. The New Urban Frontier: Gentrification and the Revanchist City. Routeledge: London. 1996. Beaulieu, Lovell. “Gentrification: the new segregation?” New Orleans Tribune, 2012. This entry was posted in Activism, Architecture, Difference: Class, Race, Gender, Disaster, Government, Justice (EJ), Urban and tagged after disaster, capitalism, disaster capitalism, gentrification, hurricane sandy, red hook, resilence, superstorm sandy. Bookmark the permalink. ← How to picture two tons of waste? Trashy theaters of proof.